We have a very particular set of skills. Skills we have acquired over a very long life of eating. Skills that make us a nightmare for anything edible. If you let us have a bite, that won’t be the end of it. We will look for you, we will find you and we will eat you. We have taken (get it?) a note out of Liam Neeson’s action movie handbook. We know what our biggest skill is – turning every occasion into a chance to eat. So, we have found these tastiest spots to see a movie because everyone knows the best way to enjoy the big screen is with a big belly. Two words: Free. Popcorn. Oh and free admission of course – but guys, FREE POPCORN. With classic flicks on the screen, plenty of drinks at the bar (that you can still see the screen from), and a menu of bites that are way better than the terrible nachos you usually get at the cinemas, you’ll want to come along every Wednesday night. Did we mention free popcorn? While life may be like a box of chocolates, we definitely know what we’re going to get at Blueroom Cinebar – scrumptious handmade pizzas topped with fresh ingredients and plenty of wine! You don’t even have to leave your comfy seat to grab a drink in these boutique cinemas, and – wait for it – tickets will only set you back $18.50. Houston, we have a problem – Hawthorne has opened a new food-filled, dine-in cinema and we have spent all our rent on mozzarella sticks. While the sassy-best friend, the candy bar, is great, the main character, the full kitchen, is where things get interesting. The menu boasts plenty of options like southern chicken bites, sliders, pizza and nachos. We dare you to try the double decker Mars, Mnickers or Malteser sundaes. By the time we finish, it’ll be time to say hello to our little friend – our food baby. 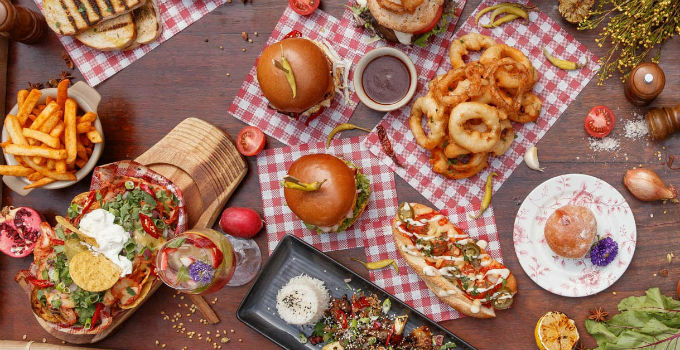 Dendy Portside is the perfect place for a pre or post-film feast. The entire area is a stretch of delicious international cuisines. May the sauce be with you at the best Portside Italian – Gusto Da Gianni’s – we recommend their delicious risotto with chicken tenderloin, mixed mushrooms, and truffle oil. If the sound of that doesn’t make you want Die Hard, head down to Atalanta, a Greek restaurant with a menu boasting such dishes as golden friend polenta crumbed chicken breast. If you’re still so hungry, Hello Harry’s Louisiana pulled pork burger will fill you up so much you’ll be saying ‘that’ll do pig’. With such great international cuisine, we know we’re not in Kansas anymore! The idea of a film and feed at the Barracks will have you saying hakuna matata to your diet. A good cheat day is simply part of the circle of life. We suggest shouting ‘good morning, Vietnam!’ to Libertine’s French-Vietnamese menu and ‘good evening’ to the dessert burger at Fritzenberger. When it’s time for the encore, don’t hesitate to try the delicious cheese and cocktails at Greenhill. At the end of the night, you’ll definitely be saying ‘I’ll be back’.